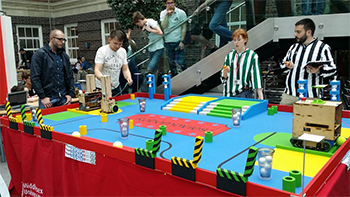 BSc Computer Science students Olegs Celinskis and Wojtek Jeziorski have qualified for the Eurobot World Finals. The first-year duo will now travel to Yverdon-Les-Bains in Switzerland to compete in the finale of the autonomous robotics competition against more than 200 students from across the globe. Leading up to the qualifying battle, which was fought at Middlesex, Olegs and Wojtek spent three months designing, building and programming two autonomous robots based on this year's theme of 'Robomovies' to complete various tasks including handing out popcorn, closing clapperboards and rolling out the red carpet. "Our first year of computer science has really prepared us for understanding the needs of Eurobot," Olegs said. "Throughout the year we have got to use various pieces of hardware such as Arduino Microcontrollers, Raspberry Pis and National Instrument FPGAs, and in physical computing we have been introduced to the basics of electronics, wiring and soldering, which were particularly useful. "We are delighted to have done so well in the competition. Beating over 20 teams of second and third-year students, who were from some well-known universities, was a great accomplishment." Commenting on his students' success, Professor Martin Loomes, Dean of the School of Science and Technology, said: "We try to offer our students in all years and courses opportunities like these. Win or lose, they always do us proud. "It is particularly pleasing to see first-year computer science students showing engineering students that they, too, have real practical problem solving skills. Modern computer science is about far more than developing programmes: driverless cars, assistive technology and the internet of things, for example, all need the sort of computing skills that Oleg and Wojtek have demonstrated."